What’s in a Leesa Sapira Mattress? What Can Be Used with the Leesa Sapira Mattress? What’s the Weight Capacity of the Leesa Sapira Mattress? Does Leesa Offer a Sleep Trial, Return Policy and Warranty? 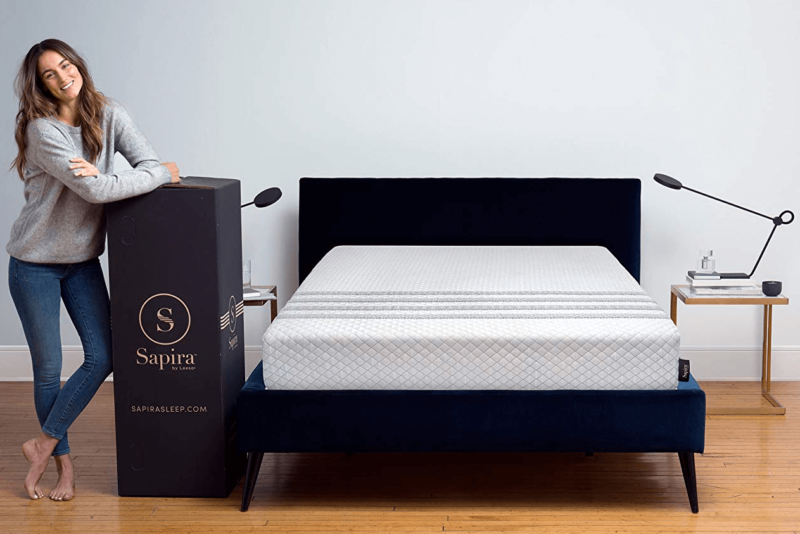 How Much Does the Leesa Sapira Mattress Cost? We’re no strangers to Leesa Sleep. In fact, one of our first mattress reviews was of the original flagship Leesa mattress. It continues to be one of our top ranked products here at Good Night’s Rest. 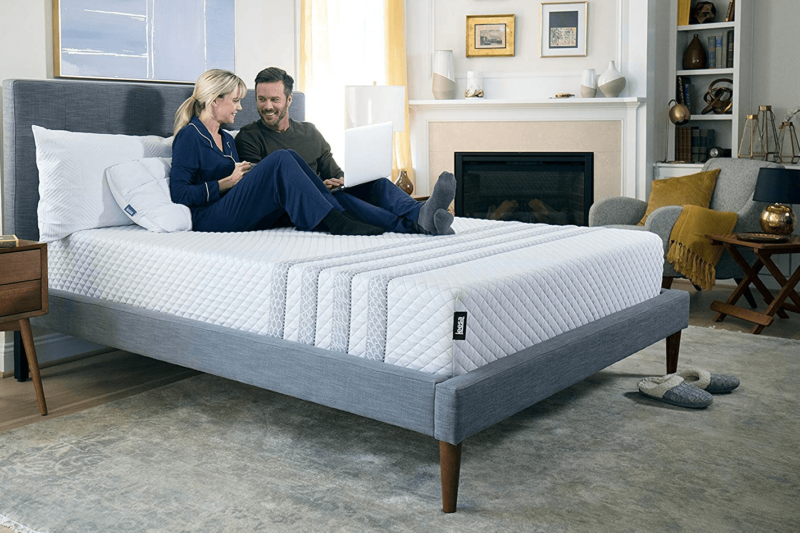 Leesa Sleep started out strong in the online mattress-in-a-box game with its “universal adaptive feel” approach. The Virginia-based company’s always had the Leesa Sapira as its hybrid and luxury variant, though. In this review, we’ll take a look at exactly what makes the Leesa Sapira a cut above the flagship Leesa mattress. Read on to find out if the Leesa Sapira is for you! Unlike its older flagship sibling, the Leesa Sapira is a true hybrid mattress. Along with four layers of foam, which we’ll find out more about shortly, there’s also a pocketed coil system inside. This design provides a measure of luxury by combining foam comfort with coil support. What does it have in common with the original Leesa mattress? The Leesa Sapira still includes Carpenter Co.’s Avena foam among its materials, as well Leesa’s proprietary fire retardant sock. It also features the same non-removable and seamless mattress cover with Leesa’s iconic four-stripe look. Everything is manufactured in the United States. Leesa does not chemically treat any of their products or materials used to make them. All foams are CertiPUR-US approved. There are three main materials that you will find inside the Leesa Sapira: Avena foam, memory foam, and pocketed coils. The physical design of the product arranges these materials into five different layers. Below is a breakdown of these layers, from top to bottom. 1.5 inches of Avena foam. Leesa touts this as a top layer that provides cooling, and they’re right! Avena foam is breathable, and perforations in the material encourage more airflow. Apart from cooling, this responsive foam also provides bounce. It’s also hypoallergenic, recyclable and naturally fire retardant. 1.5 inches of memory foam. 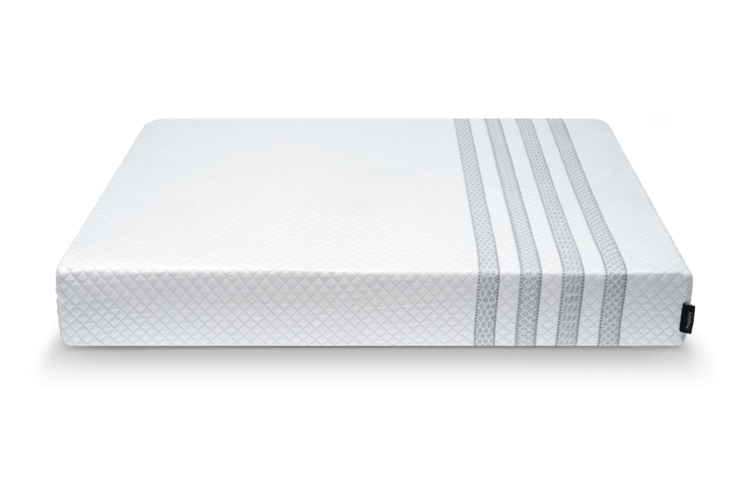 To complement the cooling and bounce of the top layer, the memory foam underneath provides contour and pressure relief. The material’s placement allows sleepers to enjoy the benefits of memory foam without all the typical drawbacks. You won’t sleep hot or feel excess sinkage on the Leesa Sapira. 1 inch of high density polyfoam. This durable foam acts as a transition between the upper foam layers and the lower innerspring layer. It’s meant to provide structure and stabilization to the mattress design. The upper foam layers support the sleeper; this layer supports the mattress. 6-inch pocketed coil system. Traditional innersprings provide responsiveness, but can feel uneven. Enter: Leesa’s carefully developed, edge-to-edge system made up of individually wrapped pocketed coils! 14.5 gauge steel pocket springs work with the high density polyfoams to give the Leesa Sapira superior support and performance. Another 1 inch of high density polyfoam. Same as the layer above the coil system, this layer helps keep the mattress construction stable. These three bottom layers work together to provide what is truly luxurious about the Leesa Sapira: motion isolation. 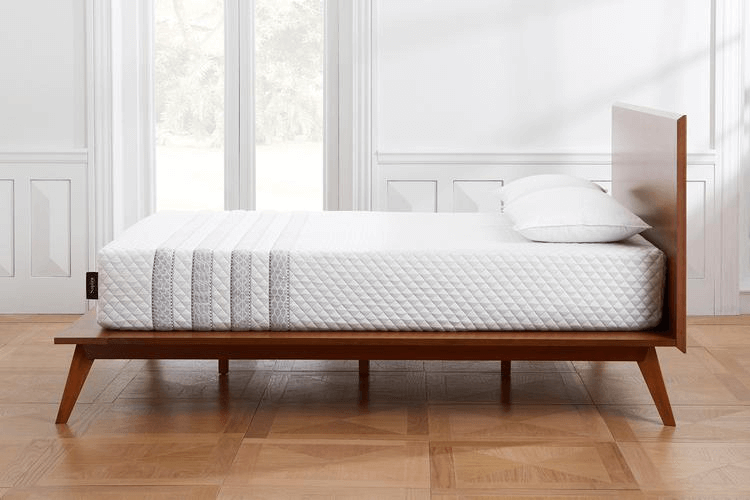 Leesa claims that this luxury hybrid mattress has almost no motion transfer. As mentioned above, the Leesa Sapira mattress cover is similar to the what’s used with the flagship Leesa. The cover’s polyester and lycra fabric blend aids in cooling. It wicks away moisture and it’s soft, stretchy, and thin—complementing the Avena foam underneath. Can You Customize the Leesa Sapira Mattress? The Leesa Sapira mattress is available in twin, twin XL, full, queen, king and California king—all standard US sizes. Unfortunately, this is where the customization ends! Leesa doesn’t offer a split queen size option, although it’s worth noting that two twin XLs can form a split king. This mattress is slightly taller than the original Leesa mattress, and a whole lot heavier. The Leesa Sapira is 11 inches thick, and its weight ranges from the twin’s 75 pounds to the California king’s 142 pounds. The most popular size, queen, is 115 pounds. Like their flagship offering, there’s also only one comfort level—no soft, medium or firm options. Right off the bat, our issues with the Leesa Sapira had to do with the mattress cover. For a luxury mattress this size and weight, we expected a thicker or plusher cover—or at least a cover that could be upzipped, removed and hand washed. We understand the importance of maintaining a brand look, though; and spot cleaning isn’t so hard. We also would have liked side handles on the mattress cover. The Leesa Sapira is heavy! Let this be a main consideration, should you be thinking of purchasing one. While it shouldn’t be flipped due to the layers inside, Leesa does recommend rotating their mattresses every few months. This would be so much easier to do with side handles or any other physical way to help along the act of moving the Leesa Sapira. Leesa recommends laying the mattress on a flat, rigid, and solid base—this could be a platform bed, foundation, metal frame, or even a slatted or adjustable base. Slats should be no more than three inches apart. Take care to make sure that you don’t use an old traditional box spring or a base with flexible or bowed slats. These are designed to change the feel of the mattress laid on them, and don’t work well with the Leesa Sapira. Using them may damage the mattress and even void the 10-year limited warranty. Have no choice but to use a traditional box spring? Place a bunkie board between the Leesa Sapira and the box spring. How Do You Set Up the Leesa Sapira Mattress? As with other mattress-in-a-box counterparts, the Leesa Sapira will be delivered to your doorstep in a compact package. We recommend moving this package to the intended bedroom before unboxing. Side note: Like the mattress itself, the box it comes in does not have handles for easy transport! Do yourself a favor and ask someone to help you move it, or use a portable platform cart. Place the rolled up Leesa Sapira on top of the bed surface and start to remove the plastic packing material. It will start expanding as soon as you do this, so make sure the space around it is clear. There may be a slight “new mattress smell” due to the packaging and compression, but it should disappear shortly. Remove the box and plastic from the bedroom—as they might be the source of the smell—and keep the area well-ventilated. As you unwrap the mattress completely and it starts to decompress further, arrange it so it sits properly on the frame or base you’re using. It will take upwards of an hour for the Leesa Sapira to expand to its full size. Give it a few days to reach its ideal firmness. Leesa also offers non-refundable white glove delivery for an additional fee in some locations. This service sends over a team that will do all the mattress setup, and for slightly higher cost, they’ll also take care of old mattress removal. The Leesa Sapira mattress supports sleepers weighing up to 350 pounds individually. This means that the larger sizes can handle 350 pounds per side, and 700 pounds overall. How Does the Leesa Sapira Mattress Feel? Like many mattresses with a single comfort level, the Leesa Sapira does its best to be “just right”—meaning not too soft or too firm. Of course, comfort is a subjective criterion and can’t be measured objectively. This is exactly why Leesa and many of its competitors offer the now industry standard sleep trial. You may be asking: Does the Leesa Sapira feel different from the flagship Leesa? Yes, it does. While many components are the same, the pocketed coil system does make a difference. Here’s what we’ve learned by combing through reviews of both mattresses. The Leesa Sapira is a little bit softer, and it’s better at handling motion transfer, too. Responsiveness and bounce are better with the Leesa Sapira, too. The is something worth considering if you have trouble getting yourself physically up and out of bed. Leesa Sleep is not an industry veteran, but it’s been around for a while. It’s a certified B Corp—meaning that has been evaulated and found professional in all the ways that count. Leesa Sleep has high standards when it comes to accountability, transparency, and performance. Their social responsibility is also very prominent. For every ten Leesa mattresses sold by the company, one is donated to nonprofit organizations helping the homeless. An Arbor Day Foundation partnership also means that a tree gets planted for each mattress sold. How Is Leesa’s Customer Support? Leesa offers an extensive FAQ and knowledgebase on their official website. Most concerns can be addressed there. If you’d like a more direct approach, Leesa’s customer service team is also available to assist you through live chat or a telephone hotline. On top of this, their social media accounts are very active and seem to interact regularly with customers—satisfied or not. Every Leesa mattress online purchase comes with a 100-night sleep trial. There’s free shipping, too. If you want to initiate a return, you will have to wait for a month. Leesa requires that you try out the mattress for 30 nights, at least. The return policy works, no questions asked. You don’t need to provide a reason for not liking the Leesa Sapira enough to keep it. Arrange a pickup with Leesa’s customer service team and they will come and get the product and then refund the entire purchase. If you live in Hawaii or Alaska, though, there’s an additional fee for the return. Should you decide to keep the Leesa Sapira, you will be glad to know that it includes a standard 10-year limited warranty. As of this writing, the queen-sized Leesa Sapira mattress is $1595—or $1370, if we go by the automatic discount applied by the official website. It is slightly more affordable on Amazon, at $1275. Apart from the mattress cover, the price is another thing we’re not too happy about! However, we do think that it is understandable considering what you get. This is no ordinary foam mattress-in-a-box. We’ve always loved the flagship Leesa—and the Leesa Sapira feels like the upgrade we didn’t know we needed! We’re fans of the pocketed coil system. The lack of motion transfer is EVERYTHING when you don’t sleep alone. No more waking up in the middle of the night because your partner had to get up to go to the bathroom. We also appreciate the cozy memory foam feeling without the unwanted excess sinkage and heat retention. What we don’t like: the lack of side handles, the general thinness of the mattress cover, and the cost. That’s it! The side handles are a nitpick, and the thinness can be easily remedied by a breathable mattress protector. The cost? Well, that’s going to come down to how you feel about the Leesa Sapira when you take it for a spin using the 100-night sleep trial. Sometimes finding the perfect mattress for you is worth the cost. If you can afford a bit of luxury in your bedroom life, we recommend you try out the Leesa Sapira wholeheartedly.